Joe Coors Jr., a businessman and one-time congressional candidate whose great-grandfather founded the Coors family beer empire, died Thursday from stroke complications. He was 74. "The entire family is deeply saddened by Joe's death," his brother Pete Coors, the vice chairman of Molson Coors Brewing Company (TAP), said in a statement. Coors was deeply involved with the family business, founded in 1873 by Adolph Coors Sr. He served as president, chairman and CEO of its ceramics and industrial company, now called CoorsTek. Coors retired in 2000 but kept working, including as a manager for the family trust, Keystone Holdings. Once called the "black sheep" of the American brewing dynasty by The Denver Post, Coors was initially ostracized from playing a key role in his family's company. Coors and his wife told the newspaper in 2012 that the exile was because of their decision to marry before Coors finished college. 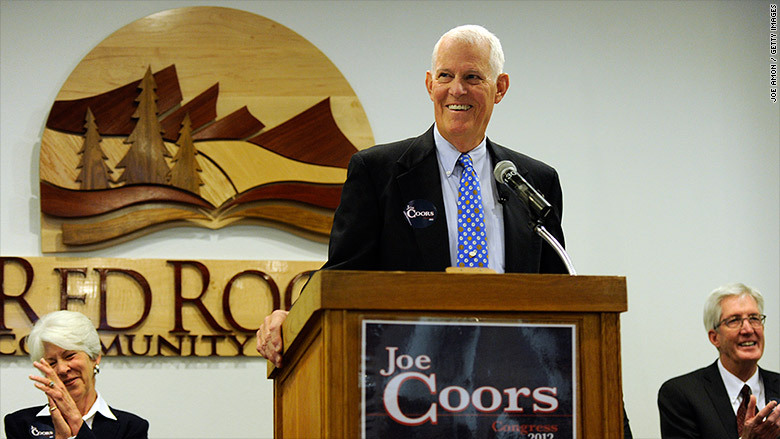 Coors ran for Congress in 2012 from his home state of Colorado. Coors, a Republican, declared in a tongue-in-cheek campaign that he was "not a beer." He lost to Democratic incumbent Ed Perlmutter. Senator Cory Gardner, a Colorado Republican, said Friday on Facebook and Twitter that Coors was "a dedicated family man whose love of Colorado will be missed." "When I introduced Joe to other members of Congress when he ran for office, it wasn't difficult to see he was a natural leader of our great state," Gardner wrote. "Joe was passionate about Colorado, and although he had a great sense of humor, he was entirely serious about the future of our nation."